Kronplatz is a great day ski area, part of the Dolomite Super Ski Region in north eastern Italy. 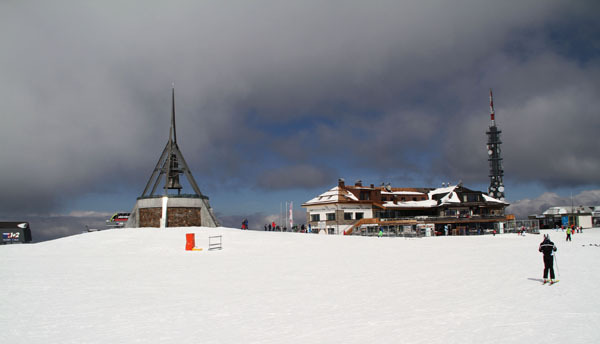 Kronplatz – the German name, or Plan De Corones in Italian, is a conical peak with skiing on all sides. Think of it as a big crown of a ski mountain with a large summit plateau area. We were impressed with the number of gondolas, 21 in fact, and a high concentration of lifts and gondolas to the one 2,275-meter summit, 7,463-feet. Skiing in the Italian Alps is not high elevation like the Swiss or French Alps, but at Kronplatz you get big vertical, as much as 4,350-vertical feet with long runs of consistent pitch down to the valleys below. With swift lifts and long uninterrupted runs, we skied 42,000 vertical on beautiful man-made snow in 22 runs our first ski day at Kronplatz. Kronplatz pitch is like Sun Valley, but the trails here are super wide and well-prepared, with top snowmaking and high-speed lifts. Apparently it gets busy at Kronplatz – 25,000 skiers in a day, with so many lifts converging at the summit. But we skied Kronplatz on a Monday in late March, often finding trails and 10 passenger gondolas all to ourselves. Kronplatz has several base villages to start your ski day -at Brunico, Perca, Sorafurcia, even San Vigilio or Picolin. This part of Italy was once Austria and it feels more German than Italian – the language, influence and signage is more like the Austrian alps in this South Tirol, yet bilingual with Italian names also represented. Kronplatz showcases many 10 passenger gondolas, like the Olang at Kronplatz has heated leather seats and Wifi for your ride, plus two stages for unloading and uploading. Lunch at Kronplatz at the mountain top at “Corones” by the big bell tower upstairs in the cozy chalet was delicious. There is also an outdoor deck and umbrella bar pumping out 80s music. At day’s end we stopped for a beer at a beautiful mountainside hut, Uita Col Dl Ancona, on our long ski back to Picolin. During an Italian ski trip to the Dolomites, we recommend a day skiing Kronplatz . While the scenery at Kronplatz is different that the jagged Dolomite peaks you see in the Sellaronda, Val Gardena and Cortina, it is beautiful as you look out at the surrounding Alps and the beautiful valleys below. The ability to ski all side of Kronplatz and the superb snow-making is amazing too.